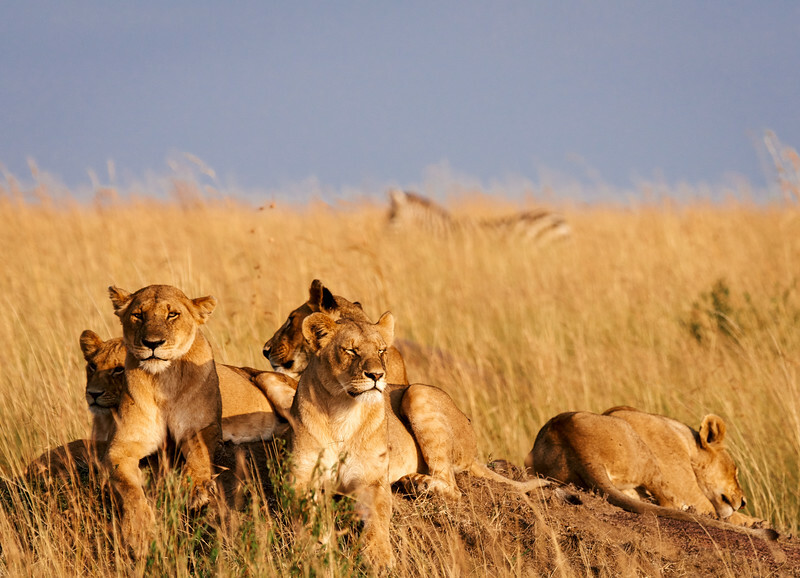 The are the “Kings of the Jungle” despite there being no jungle in the plains of the Maasi Mara. But, there is no denying these creatures are truly majestic and regal. While they sleep much of the day, we had the opportunity to see the lions in some very active states: hunting, mating, and just lounging around. Here, this male lion was just watching his surroundings. We were able to approach pretty close in our vehicle without scaring the lion away—really, I doubt the lions get too scared by the vehicles. Personally, I like the black and white version of this image more—it creates more sense of majesty. But, the hues that are seen in this color version are also very appealing. Zebras are actually quite difficult to photograph. Until you actually see them in the wild, and attempt to get a good image, you wouldn’t know this. But, they are cautious animals, so when a person or vehicle approaches, they either start to run away or turn and face the opposite direction. 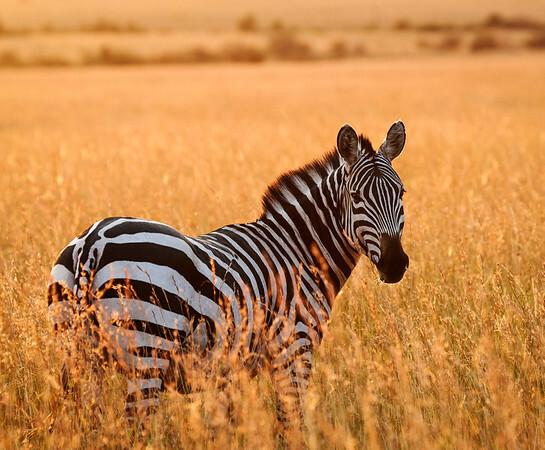 All that makes capturing an image of a zebra from the front inherently difficult, especially from shorter distances. As the sun set one evening, we observed a number of zebra eating and enjoying the last light of the day. The sun, which was very close to dipping below the horizon, cast a beautiful golden glow on the grass, which really helped to accurate the strips of this zebra. I just love the colors and hues created by the low angle of the sun in this image. 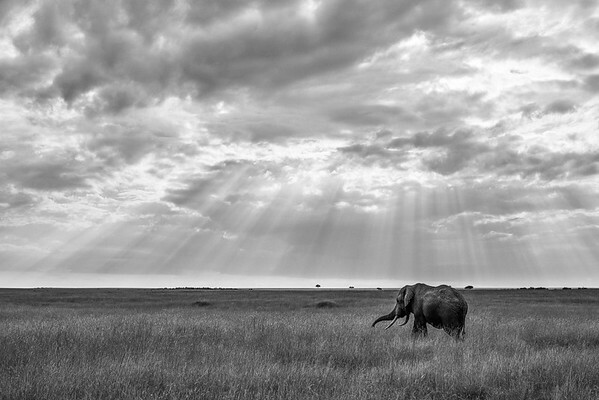 One of my favorite images from my time in the Maasi Mara! The Great Migration of wildebeest into Kenya’s Maasi Mara begins with a trickle. The first groups of wildebeest begin arriving, and crossing one of a few rivers into the Mara. Famous documentaries show the wildebeest crossing croc infested waters, and those scenes exist. However, on this day the wildebeest were crossing a smaller river that did not have crocs. We (and hundreds of other people) watched as the wildebeest cautiously approached the riverbank to see if it was safe to cross. It took maybe an hour before the first animal made the attempt and then it was followed by hundreds more in quick succession, before something spooked the group and they retreated away from the river. Given the angle I had to shoot from, I decided tot ry some more long exposure shots, with the goal of showing the motion of the crossing. This actually worked out quite well in this instances, as a few of the wildebeest stopped long enough for water that they are static while a large number of the animals flow in the background. There is something bout sunrises in remote places. I can’t put my finger on it, but they are so much more enjoyable and magical than a sunrise in an urban environment. 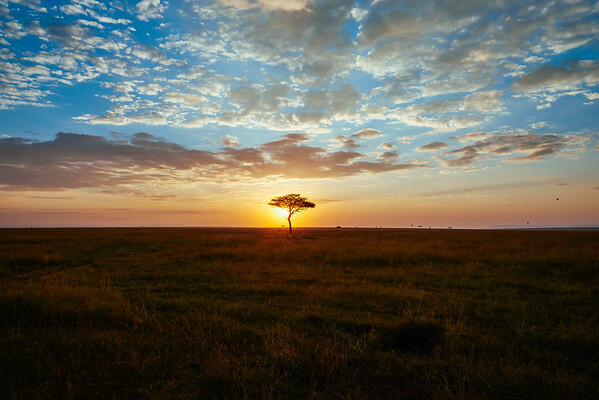 It actually wasn’t easy to photograph sunrises or sunsets while in Kenya’s Massi Mara. While I had a tripod, having to shoot from inside our vehicle meant it wasn’t convenient to use the tripod. Instead, I would use a beanbag on the roof of the vehicle and try to get the shot. In this case it worked. I love this single twisted trees that grow all over the plain. They create such a wonderful subject for these types of sunrise images. In the Maasi Mara (and I assume elsewhere), once male elephants reach adulthood, they are kicked out of the group and they the roam on their own or with another male. 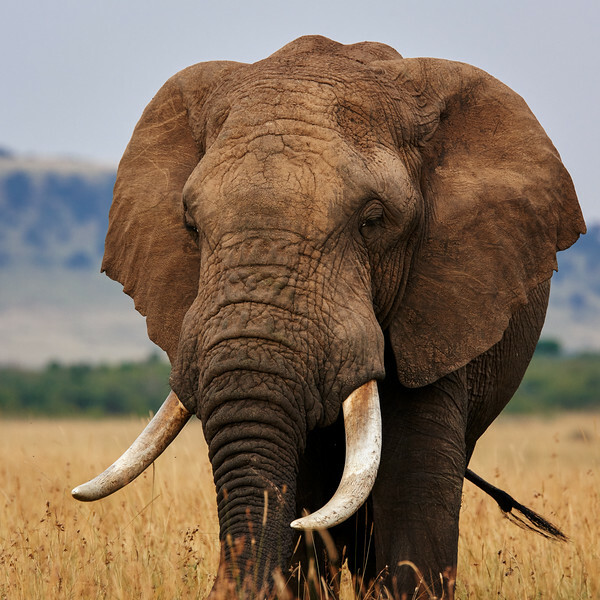 So, the way to see the largest elephants with the longest tusks is too look for a single elephant or a small group. We were driving in the Park after our morning game drive, and came across a single bull elephant approaching the trail. We stopped and had a great time photographing him as he came closer and closer. When he finally lowered head, and began flapping his ears (a sign of impending charge), we moved away and allowed him to continue on his path. It was then, once he had moved to the other side of the road, that this scene presented itself: the elephant along on the plain, the clouds overhead, and the sun rays streaming down through the clouds. I quickly grabbed by second camera with the wide angle lens, and captured this image. On my first full day in the Maasai Mara, we came across a pride of lions enjoying their kill from the day before: a huge after buffalo. The lions had killed the buffalo the day before, and the carcass had almost been completely stripped by the time we got to the scene. The lions were enjoying a leisurely meal, and this male was clearly in charge and taking first position in the eating line. Being my first morning in the park, and never having seen anything like this before, it was a great introduction to the cycle of life and the power of the top predators of the savanna. Hippos are one of the most dangerous animals in all of Africa. They look too big to move quickly, but they can run at astonishing speeds—underwater and on land. And, as this image shows, the teeth of a hippo are anything but deadly! This was a great evening! There always tends to be a group of hippos in this area of the river, so coming here was saved for the last evening of our trip. We went down to the waters edge, still far enough away from the hippos to be safe, and had a great time photographing them as the sun set. 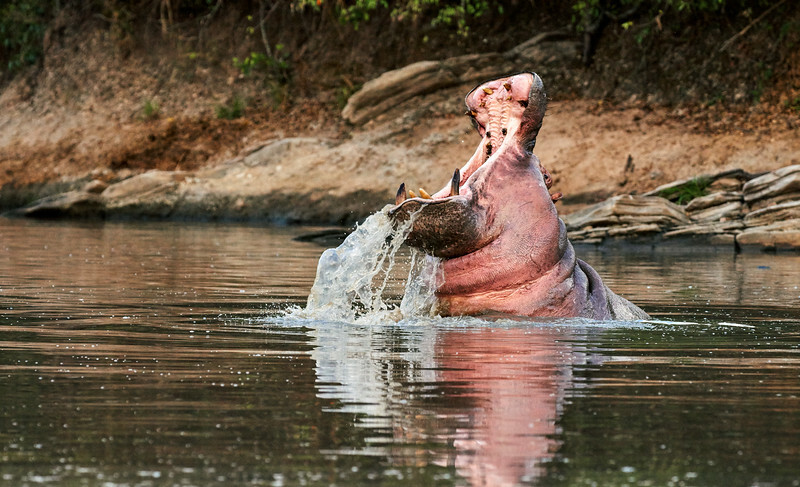 Champagne was served to celebrate a wonderful week—and let me tell you, there are few thins better than drinking a glass of champagne while photographing hippos in their natural habitat. This specific hippo was out in the middle of the river alone, and so I focused on it for a while. He (or is it a she) would dip under the water for a while, then emerge. But every so often, he would rise out of the water with a huge gaping yawn. A sight that is simply remarkable to behold. This was my first real experience with an elephant in the wild. We were returning from our morning me drive when we saw this solitary male elephant heading towards the trail we were on. We got as close as possible before stopping and observing the elephant on his approach. It was a great sight to see! The large body moving effortlessly through the plain, with his tail and trunk swinging as he walked. Eventually he got close enough, and began displaying some aggressive traits, that we moved along so as not to risk having him charge our vehicle. I arrived in the Maasi Mara about a week to early. Heavy rains in Tanzania has kept the wildebeest on that side of the border longer than expected, and so we didn’t get to see the millions of wildebeest that constitute the Great Migration—instead we only got to see tens of thousands. When you spend a week of 10 hours a day photographing, you eventually start looking for ways to challenge yourself, and in my case (and many in our group) one challenge was to try panning with longer exposures. This was one of my first attempts, and one I’m very pleased with. 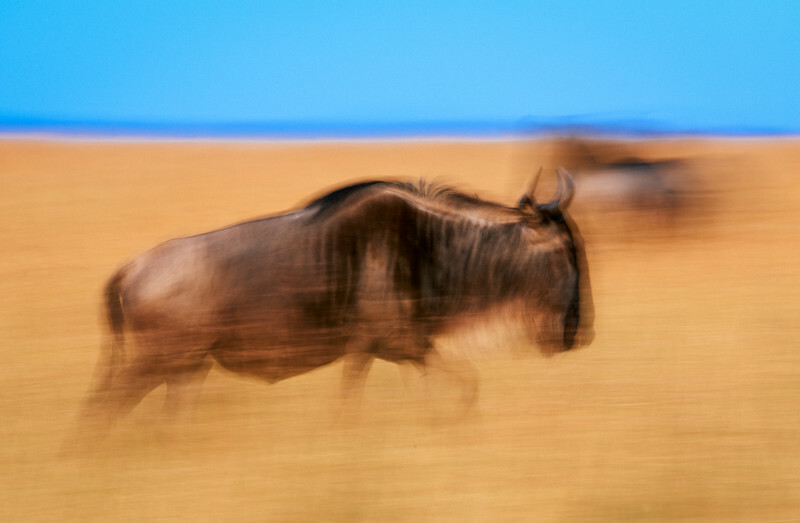 The colors are just so vibrant, and the sense of movement is clearly shown, but also the wildebeest is still recognizable. Not too bad for an early attempt. One my full first day in the Maasi Mara, we (along with a bunch of other visitors) came to view a pride of lions feasting on the remnants of a buffalo they had killed the previous evening. I say “remnants” because there wasn’t much left of the buffalo except the bones, but the lions continued to enjoy every last morsel. 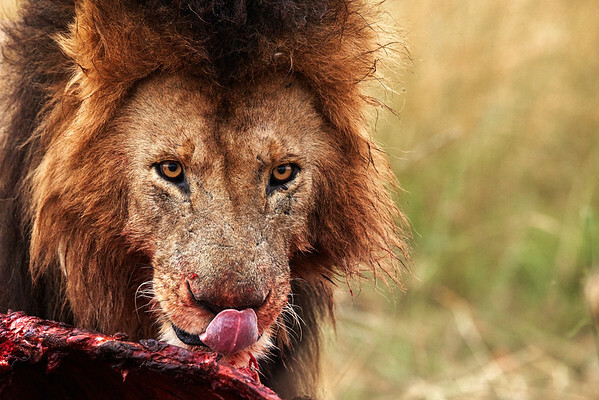 This large male lion was given a wide birth by the lioness of the group, and he got the first pick of what he wanted from the remains. After about 30 minutes, he took a break and I was able to capture this image as he cleaned off his upper lip. 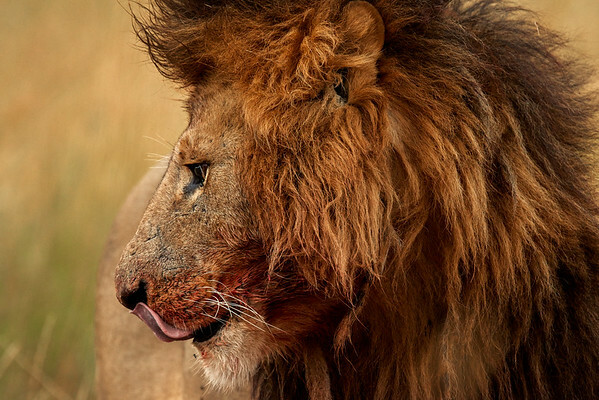 I just love how the red hues of his mane help to highlight the blood red stains around his mouth. 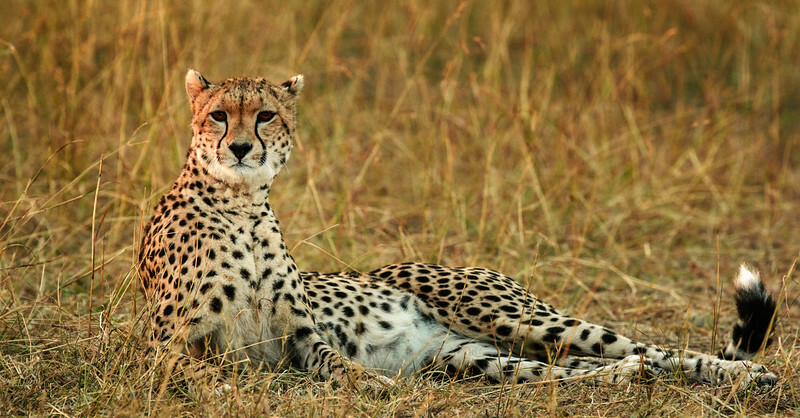 Early one morning, we headed out and towards an area that was frequented by a cheetah mother and her four cubs. The previous day we’d heard a talk by the local cheetah conservancy, and learned quite a bit about this amazing animals, including how friendly they can be (in the past, some even kept them as pets). The group of cheetahs was a lot of fun to watch. They were quite playful with each other and moved around a lot. After a while, they all laid down to rest for a while, which was when I was able to capture this image of one of the cubs lounging around. 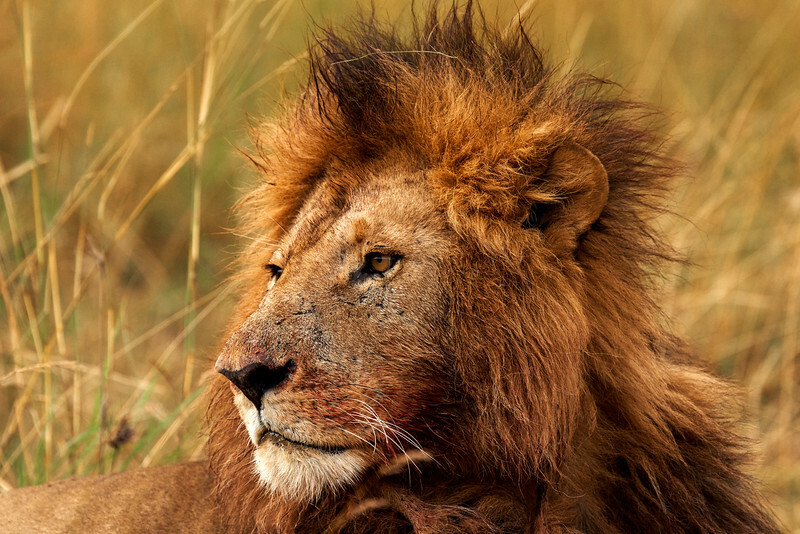 The are the “Kings of the Jungle” despite there being no jungle in the plains of the Maasi Mara. But, there is no denying these creatures are truly majestic and regal. While they sleep much of the day, we had the opportunity to see the lions in some very active states: hunting, mating, and just lounging around. Here, this male lion was just watching his surroundings. We were able to approach pretty close in our vehicle without scaring the lion away—really, I doubt the lions get too scared by the vehicles. I played with the color version of this image for a long time, but in the end I think black and white does it more justice. The lion looks even more like the traditional King in black and white. 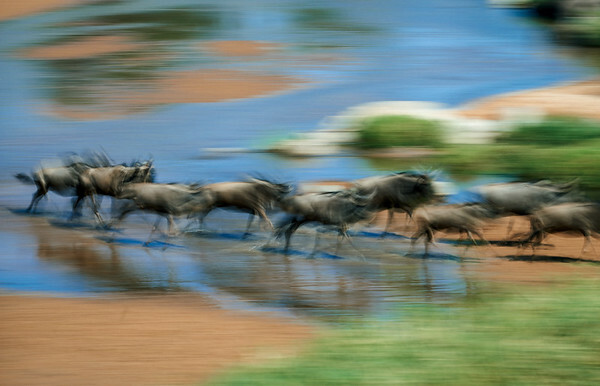 Here is a second, slightly different take on my favorite image of the wildebeests crossing a river in the Maasi Mara. 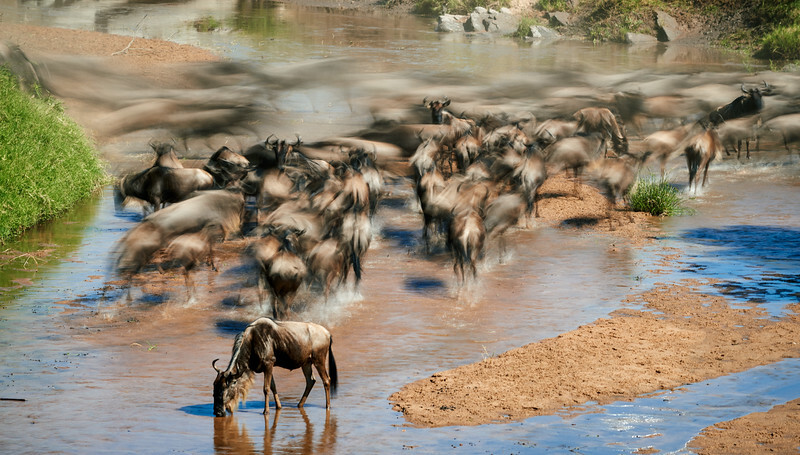 The Great Migration of wildebeest into Kenya’s Maasi Mara begins with a trickle. The first groups of wildebeest begin arriving, and crossing one of a few rivers into the Mara. Famous documentaries show the wildebeest crossing croc infested waters, and those scenes exist. However, on this day the wildebeest were crossing a smaller river that did not have crocs. We (and hundreds of other people) watched as the wildebeest cautiously approached the riverbank to see if it was safe to cross. It took maybe an hour before the first animal made the attempt and then it was followed by hundreds more in quick succession, before something spooked the group and they retreated away from the river. Given the angle I had to shoot from, I decided tot ry some more long exposure shots, with the goal of showing the motion of the crossing. This actually worked out quite well in this instances, as a few of the wildebeest stopped long enough for water that they are static while a large number of the animals flow in the background. I found myself shooting into the setting sun each evening while in the Maasi Mara. This wasn’t by design or even was I forced to. Rather, I really found the effects pleasing as I got some flare and deep colors by these angles. This image was captured shortly before the sun set while I was watching a small group of zebras. I had been zoomed in more to isolate the zebra and reduce the sun flare, but then I zoomed out and captured this image. It’s hard to explain why I like some images more than others, even ones taken within minutes of each other. But, here is one such instance. 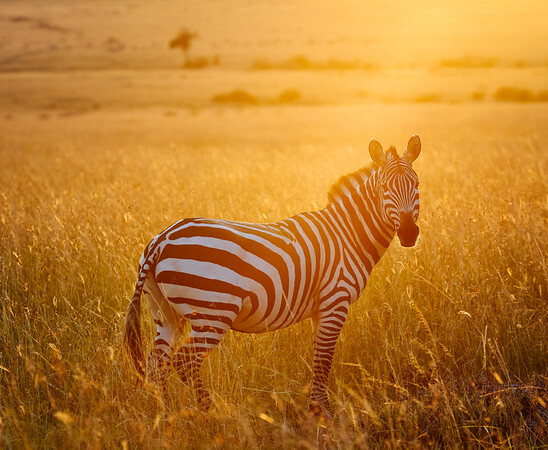 The strong sun rays coming in from the top of the frame and highlighting the zebra just help make the image. Early one more we were out and came across this pride of lions. They were just lounging around and not paying too much attention to their surroundings…the same was true for two zebra. This image shows the first of the zebra casually walking about 50 meters behind this group of lions. The wind must have been blowing in the wrong direction (or the correct direction for the zebra) because the lions didn’t realize prey was so close. What was amazing was watching as, about 15 seconds after this image was captured and the two zebra had passed the lions, the zebra realized their situation as easy prey and actually reversed direction and walked back from they had just come, putting them very close to the lions! Seemed like they were walking back into the lions den—literally. Only too late did the lions realize their lost opportunity. 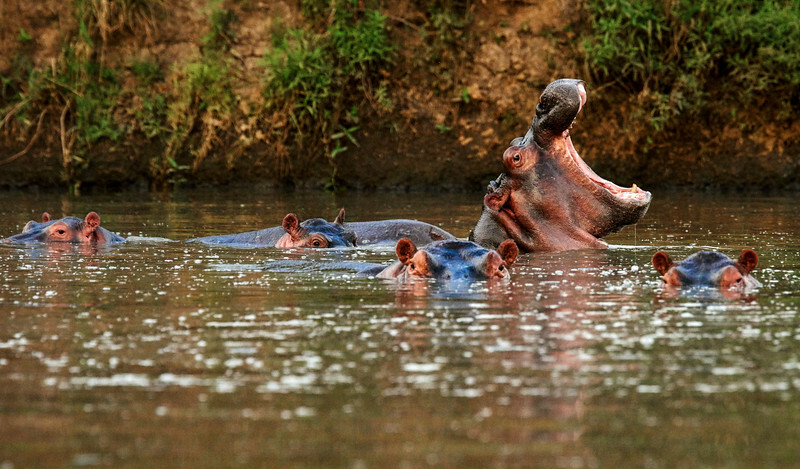 I loved photographing the hippos while in Africa. They look so peaceful, but are actually one of the more dangerous animals in the world. And, while in the water, their massive size is hidden, as they keep most of their body underwater, while just their eyes appear to float just above the surface. But, every once in a while, one of the hippos would rear up, rise far out of the water, and open their mouth wide. The sign was ominous and clear: this animal could do some serious damage! This small group of hippos congregated in a small tributary of the local river, and we went there one evening to view and photograph them. It was simply amazing to watch and photograph them from a distance. 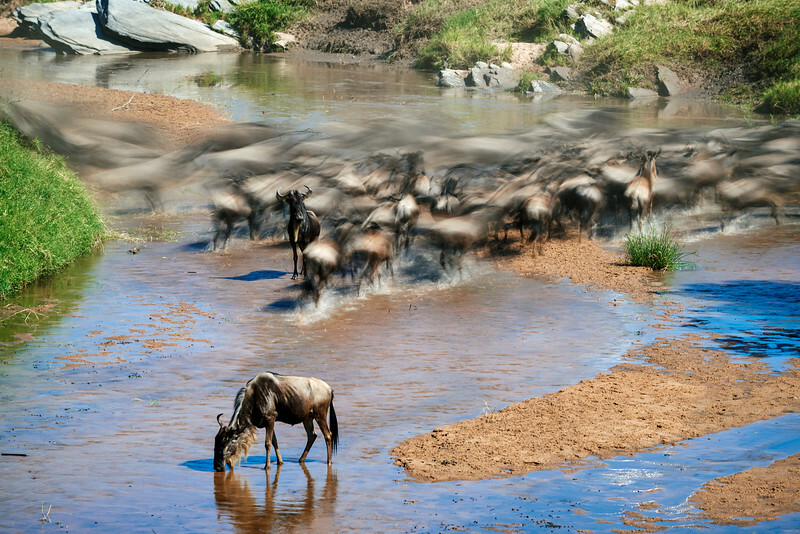 It takes a lot of patience to watch wildebeest cross a river. First they mass on one side of the river. We woke up one morning to reports of an impending crossing, and where they had been almost no wildebeest the previous day, there were now tens of thousands. The were massing, and once enough had arrived, they would attempt a crossing. Then, they have to scout out the crossing point, which can take a long time. Understandably these animals are very weary about crossing the river, which is a time they are vulnerable to attack. The slightest noise or disturbance on either side of the river will result in the wildebeest scattering and running away from the river. But, when the do finally decide to cross, it is a sight. This small group made a quick crossing, which I captured using a panning and long exposure technique to show the movement of the animals. The are the “Kings of the Jungle” despite there being no jungle in the plains of the Maasi Mara. But, there is no denying these creatures are truly majestic and regal. While they sleep much of the day, we had the opportunity to see the lions in some very active states: hunting, mating, and just lounging around. Here, this male lion was just watching his surroundings. We were able to approach pretty close in our vehicle without scaring the lion away—really, I doubt the lions get too scared by the vehicles. I played with the color version of this image for a long time, but in the end I think black and white does it more justice. The lion looks even more like the traditional King in black and white.